In the annals of recent Important Rock Bands, the ‘90s had the self-destruction of Nirvana, the slacker ethos of Pavement and the glorious noise of Sonic Youth, and the early 2000s had the willfully obtuse experimentalism of Radiohead. We now live in the age of Arcade Fire, the Montreal conglomerate—comprised of husband-and-wife team Win Butler and Régine Chassagne, along with Richard Reed Parry, William Butler, Tim Kingsbury, Sarah Neufeld and Jeremy Gara—that in the last six years has stepped forward, willing and wholly assured that they’re the ones to carry such a title. They’ve made their intent known by album names alone: 2004 debut LP Funeral was followed three years later by Neon Bible. Death and religion are portentous subjects to build albums around, but the band had the vision and power to meet the attendant expectations. Their latest release is The Suburbs, which at first doesn’t seem likely to bear the same iconographic heft as its predecessors. 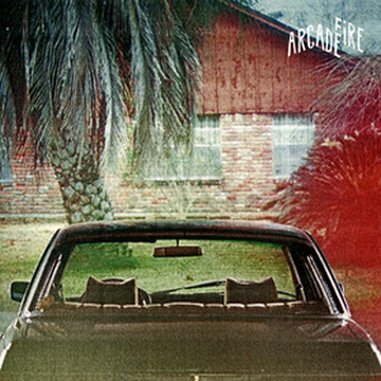 But swelling at 16 songs and an hour-plus runtime, it’s Arcade Fire’s most ambitious and concept-driven effort to date. The title track is oddly at ease—jaunty, even. It doesn’t feel conceptual at all, even with lyrics alluding to dropped bombs and fractured cities. With a disarmingly gentle guitar strum and piano for melody, Win Butler sings, “Your part of town against mine / I saw you standing on the opposite shore / But by the time the first bombs fell, we were already bored.” It suggests a universe parallel to that of Funeral’s opening track “Neighborhood #1 (Tunnels),” but instead of digging “a tunnel from my window to yours,” there’s division, not unity; war instead of peace. There’s no explosion into triumphant anthem—this time the song dissolves with a high glissade of strings. The fracture continues to spider with “Suburban War,” as Butler sings, “Now the music divides us into tribes / Choose your side, I’ll choose my side.” The band straddles a division of their own, at once rocking more fiercely than ever before while delving deeper into synthesized tones. First single “Ready to Start” boasts snare drum bursts and guitar fuzz unexpectedly reminiscent of The Strokes’ ecstatic “Last Night,” but then veers off into a synth-spiked breakdown. “Modern Man” sounds a bit like Rick Springfield’s “Jessie’s Girl” (in the same dark, wry way that Neon Bible’s “Keep the Car Running” seemed to update John Cafferty & the Beaver Brown Band’s “On the Dark Side”), but never quite reaches Springfield’s stadium-ready chorus. Vast stretches of The Suburbs feel tamped down, as if the album is sonically emulating its subject. Where past Arcade Fire songs built upwards, these unfurl flat and wide; the euphoric spikes that served as Funeral and Neon Bible’s beloved rallying points are strangely absent here, spaced farther and farther apart. Arcade Fire seems to be testing us, luring us down into the lowlands. A vein of emptiness and Beckett-esque waiting courses throughout; as so often in real life, these suburbs are a kind of purgatory with no exit in sight.